It was another rough day for Nancy Pelosi. The House Intelligence Committee voted Monday afternoon to release of the secret FISA Memo. Not a single Democrat voted for transparency. The memo which was open to all House members to review was read by 190 Republican lawmakers and only 10 Democrats in the last week. Pelosi has not said if she actually read the memo. But that didn’t stop her from saying the memo was dangerous and untrue. “Chairman Nunes’ memo contains significant inaccuracies and omissions that misrepresent the underlying intelligence and jeopardize the effectiveness of our intelligence and law enforcement communities,” Pelosi added. 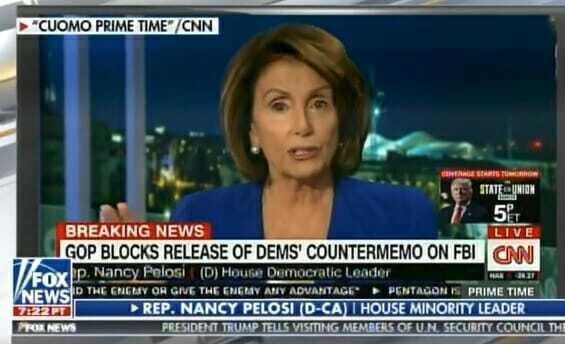 Minority leader Pelosi then went on CNN and stuttered her way through an interview on the memo. Nancy Pelosi: They have made up a memo that isn’t even true. And they’re lying to the American people. Chris Cuomo: So what are you going to do about it? Nancy Pelosi: The Republican Party has crossed over to cover up. They’re deadly afraid of the Russia investigation. Nancy Pelosi: With all due respect, you really don’t know what you’re talking about right now!